OCXO is an abbreviation of Oven Controlled X-tal Oscillator. OCXO’s are the highest performing type among Quartz Crystal controlled oscillators. The Quartz Crystal is placed in an oven device which is heated and controlled with high precision to a temperature which corresponds or matches one of the turning points shown in the graph 1 as a blue line depending on the actual cut angle. 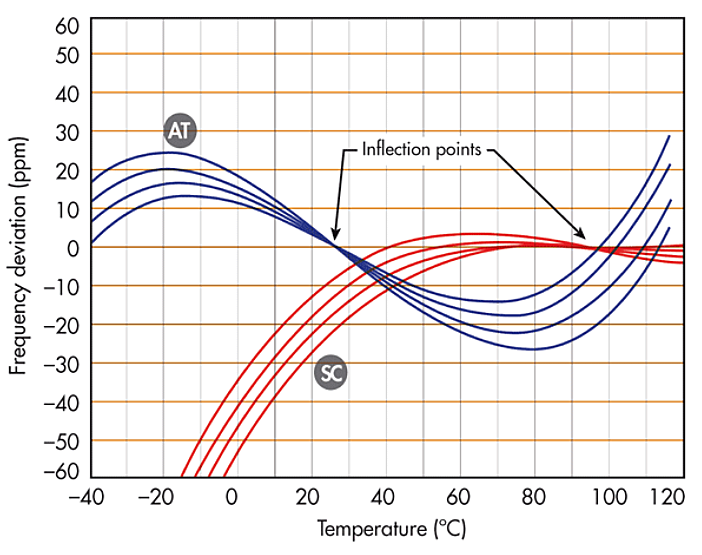 The red curves shows temperature dependence of SC cut Crystals using the lower turning point and the blue curves shows AT cut Crystals using the upper turning point. The purpose to work at the turn over temperature is to minimize the crystals inherent contribution to external temperature changes. As can be seen on the graph the SC cut has a lower temperature coefficient at the turn over temperature (red local maximum) and the AT cut (blue local minimum). But the main advantage with the SC cut is the lack of transient response for dynamic temperature changes which is due to the lack of stress sensitivity leading to improved thermal behavior thus better frequency stability. An OCXO exhibits approximately 100 times improvement in frequency vs temperature dependence compared to an unheated crystal 2. One disadvantage with OCXO’s are their higher power consumption and therefore makes it unsuitable for battery applications. Opposite of XO’s and TCXO’s which reaches their specified frequency stability instantly after power on. The OCXO requires a warm up time of a few minutes before it reaches its specified temperature stability. The power consumption is higher during the warm up time but settles to lower values when the OCXO has reached its steady state of operation. Power consumption is inversely proportional to the external temperature. Besides the best frequency stability vs temperature available in OCXO’s another big advantage is the superior short term stability. 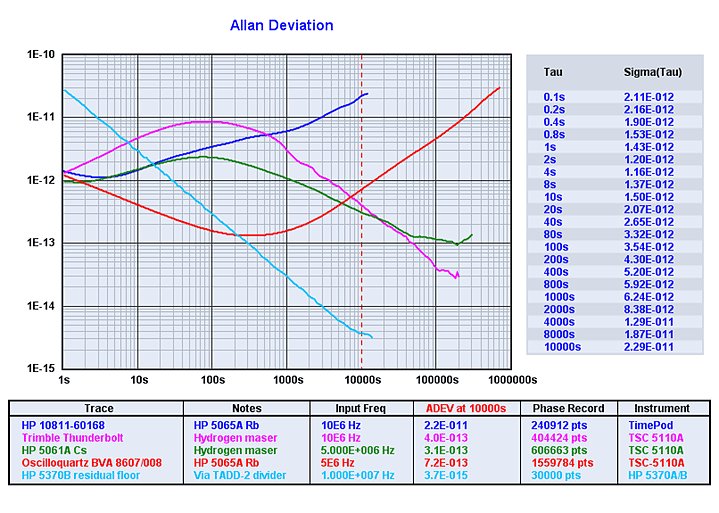 The most common method used to characterize the short term stability in the time domain is to plot the Allan Deviation vs measurement time (τ, tau). 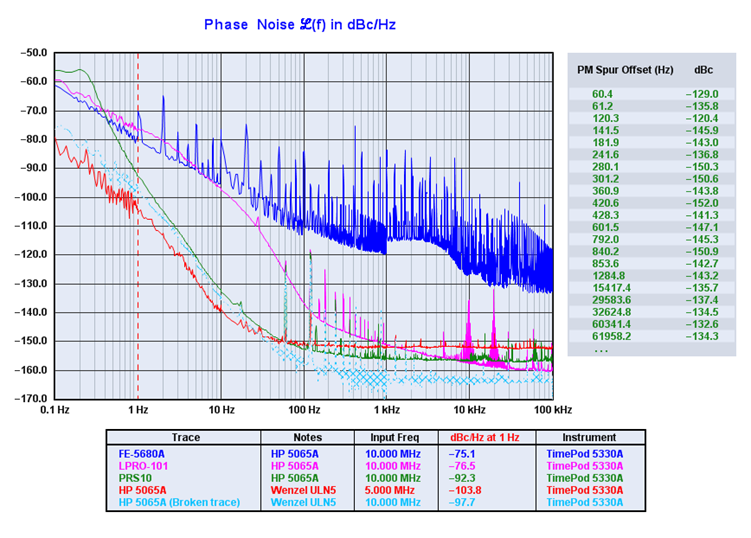 Measurements time below 1s is best characterized in the frequency domain by the Phase Noise. If we look at the short term stability in the time domain the OCXO is best characterized by an Allan Deviation measurement 2, 3. In the frequency domain a Phase Noise measurement will reveal all details. Precision Frequency Control Vol.2 Edited by E. Gerber and A.Ballato. Academic Press ISBN 0-12-280602-6.